People usually associate Southern California with fields and fields of orange groves, but the area where I live was once covered with hundreds of olive trees! I have a remnant of this in my backyard, where a huge, beautiful olive tree provides shade. While many California olives go into olive oil, California is also the birthplace of those ripe, mild black olives we all know and love. 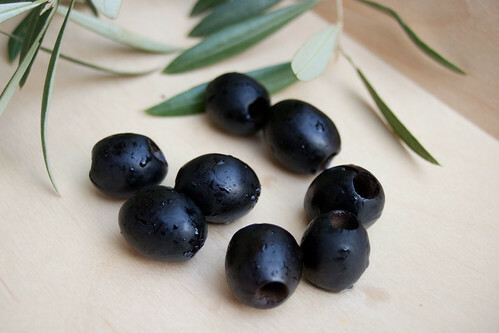 I have many fond memories of olives gracing our family events, whether it’s a layer in the classic seven layer dip on the Fourth of July or a feature of the Thanksgiving relish tray (My grandmother used to entertain me by popping the black olives on her fingers. Haven’t we all done that?) 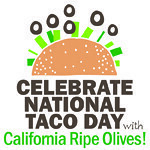 When California Olives and Kitchen Play asked me to develop a recipe for National Taco Day, I welcomed the opportunity. We’re all familiar with the role that California black olives play in traditional Cal Mex cuisine — they’re a regular feature of nachos, enchiladas, and taco salads. I decided to use them in a slightly different format, creating a taco inspired by the flavors of Latin America and the Caribbean. I used the olives to make a variation of picadillo — a spiced meat mixture that is both sweet and salty. I upped the Caribbean flair by adding to each taco slices of fried bananas. 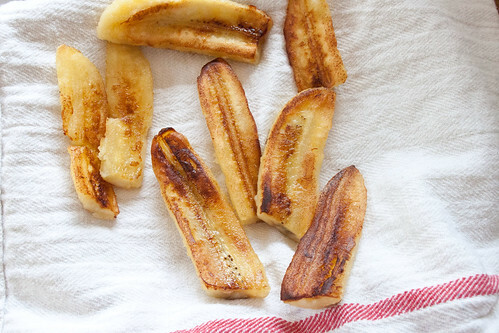 Plantains would be traditional, but I can never find plantains in just the perfect stage of ripeness, and slightly underripe bananas make an admirable and easy-to-find substitute. The final dish is both exotic and familiar — the Nuni, who eyes any new foods with suspicion (what can I say? She’s five.) scarfed two of these down. The tacos are also very satisfying – the sweet bananas and peppers perfectly complement the saltiness of the California ripe black olives. 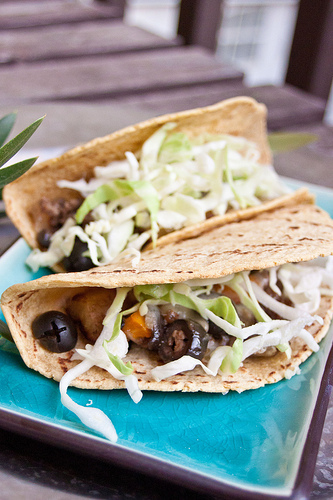 For more taco-themed recipes using California Ripe Black Olives, please visit Kitchen Play’s California Olives Sidecar Event! Also, be sure to join Kitchen PLAY, California Ripe Olives and some of your favorite food bloggers for a Twitter Party on October 16th, 7:00 PM EDT. Learn about this tasty, nutritious and versatile food. Have fun testing your olive knowledge. Win great olive prizes! Register here. My CA Ripe Olive fact: California Ripe Olives dress up any dish – it’s a truly versatile ingredient. In a large skillet, heat the olive oil, sauté the peppers and onions until softened. Add the ground beef, break up using a large spoon, and cook until the meat is beginning to brown. Add the cumin, allspice, olives, vinegar, honey and salt and pepper to taste, and cook until the meat is cooked through. Slice each banana in half, and then in thirds lengthwise. Heat some olive oil in a nonstick skillet and arrange the banana slices in the oil. Fry a minute or so until golden brown, then turn and fry the other side. Preheat the oven to 375. 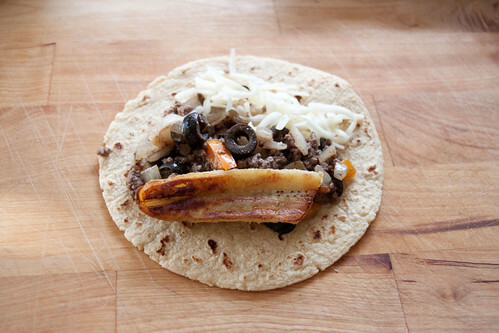 In each corn tortilla, arrange some of the meat filling, a slice of fried banana and some shredded cheese. Arrange the tacos in baking dish so that they overlap and keep each other "closed". Bake in the oven for about 5 minutes, or until the cheese is melted. Top with shredded cabbage and serve.